After just reading through this entire thread in 1 sitting, I like the "|e" theory for the stage layout. It certainly seems consistent with the U2-|e graphic.... a main stage connecting to a round B stage. 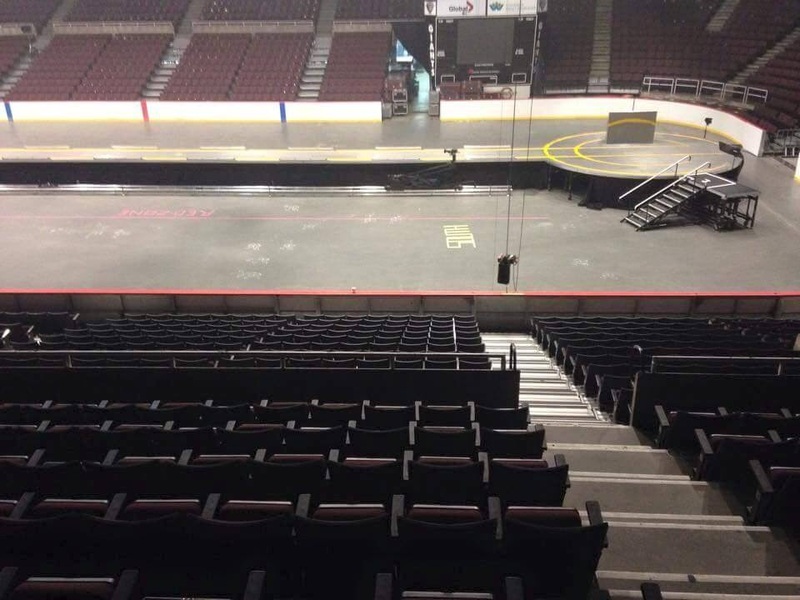 It also makes sense that the (RED)Zone seats would be by the B Stage. I have RZ for both Toronto shows, and I actully think this will work out great! Being a little further from the main stage will allow for a great view of whatever visual effects they incorporate this time, during the full energy elements of the show. And then when they go for the more intimate acoustic bits, you'll be up close and personal! Also, bear in mind that the main stage is always taller than the B stage, or outer ramp. Bono never has direct crowd interaction from the main stage - it's always out on the ramp or B stage. So ya, I'm pretty happy about scoring RZ for 2 nights!! Totally agree. That was my experience with it last tour too, really. Excited! just to add weight to this discussion I am the U2 fan who saw the stage presentation U2.com posted on the website then was quickly taken down again. 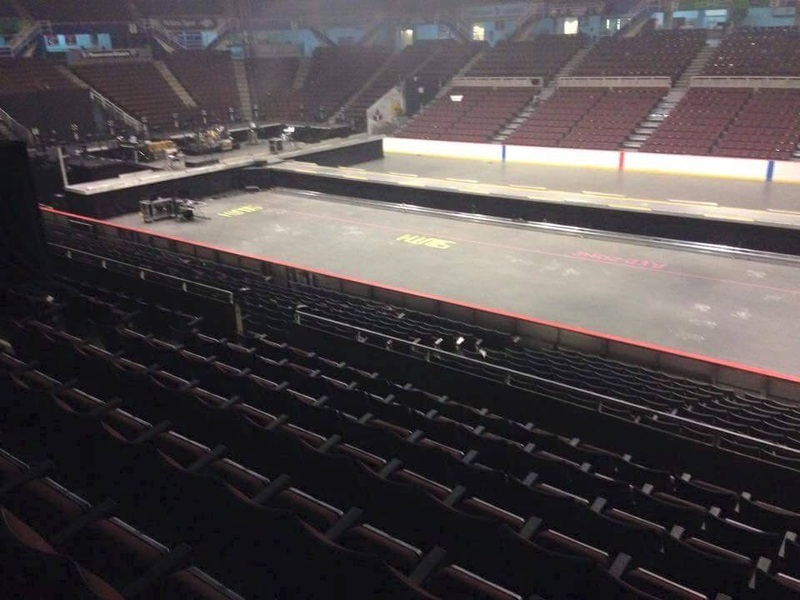 Its now confirmed the stage will be in the middle of the GA floor - the long catwalk. There is no End Stage/Rear end stage or "B" stage. Its looks like Larry Mullen Jnr's drum kit will be on a rounded platform which I predict will turn 360 degrees. In addition the screens will be located above the stage similar to the 360 screen but a double sided screen - no idea if the screen expands. Please note I forgot to add the red zones - from what I saw the red zone will be by the Edge on both sides of the stage. We all know by know the stage is a long catwalk going across the GA floor.. So we have a rectangle shaped stage - the band will be able to utilise the stage bar Larry who will be on a turning circle stage. There was amps and speakers I believe or other equipment's on the stage. The orchestra was to the right of the stage and crew was to the left. The screen is like a mini version of the 360 but its double sided LED screen on top of the catwalk stage going across the whole catwalk in 360 degrees. The ziggo map has been out for some time (it's not new at all), and is consistent w/the San Jose map, etc., that clearly has the RZs by the b-stage. The brand-new Vancouver info (apparently emailed to RZ ticket holders there), if it's for real, is radically different from any and all previous information. It also really pisses me off; if this new info is real, I would have never have bought any seated tix. ATU2 is running the Vancouver map as confirmed as well as some other info from LiveNation about the tour, so I think it is official. I'm not convinced.... the person who originally tweeted this map to ATU2 said it was sent to a friend who has Vancouver tickets (I've corresponded with her directly via Twitter, and she can't back-up her source). This map hasn't surfaced anywhere else, including on the official TicketMaster or Live Nation websites. They still show maps that suggest the RED Zones at by the "e" stage. Whichever way it woks out, I'm not fussed either way. I'm not sure the catwalk RZ experience would have been very good, RZ would be very, very close to that screen. Spoilers? I'm not sure, but if they are spoilers, please stay on topic. I don't really want to know what songs are likely to be played. You sound fucked. or boring. Have you figured it out yet? I went to the May 15 show in Vancouver. There's actually a lot of action at the second stage and along the runway, not just Bono.